Click here to see photos from “The Invention Of Everything Else” CD Release with Chris Abad, Tony Maceli and Jamie Alegre. See, I have a long history of uncool. I wasn’t in the “cool” crowd in high school, wasn’t in the “cool” band in college, and — while I am surrounded by entire industries that arbitrate (and buy, process, and repair) “cool” here in New York — I’ve always been outside of it. Even at work. Heck, especially at work. I’ve taken plenty of guff for my taste since stepping through the rotating doors there in 1995. Example: 90s “alternative rock” sensation Toad The Wet Sprocket. I wouldn’t call myself a huge fan, but I owned a few of their records back in the day. I’ll say it: “All I Want” is a pretty fantastic single. It’s crisp, catchy, and evocative. The lyrics are fairly substantive, and you can sing along. That’s all I really ask. In addition to crafting a fine, mid-album rock song (that seems to borrow liberally from John Fowles’ 1963 novel, “The Collector”), the band is onto something here. 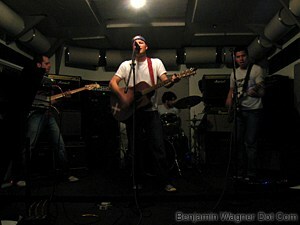 Ultrasound Rehearsal Studios, 251 West 30th Street, New York City. Chris, Tony, Jamie and I have run the set for tonight’s “The Invention Of Everything Else” CD release twice. Everything sounds great. Not perfect, but great: lived-in, listened-to, and loved. It’s 11:38, so we’ve still got twenty minutes to kill. “Do we wanna’ prepare an encore?” I ask. Fast forward to 11:43. The band has found its way into a five-year-old song of mine on which none of them have ever played. In fact, on the record, it’s just two acoustic guitars and one voice. Here, though, is the nature of collaboration. Here, then, is the sound of four friends. As the song builds naturally, and we get closer to its big finish, all of the instruments come together until I can’t hear anything at all. So I don’t care what you call it, or whether its cool or current. For me, the thing is the goosebumps. Everything else is just pyrite.